The Chambersburg (PA) Half Marathon has been around for 35 years, yet somehow I avoided running it. 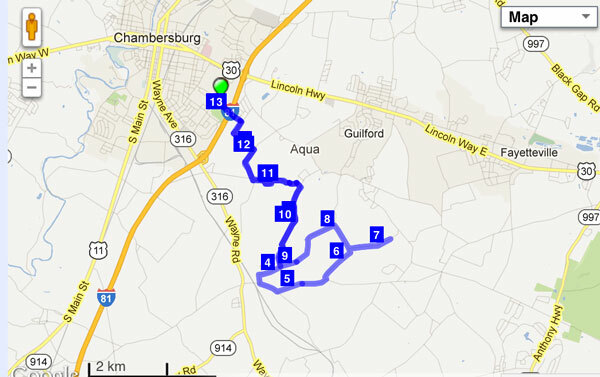 Friends talked of this race and I had heard it all: Chambersburg is hilly, it’s hard, it’s cold. So of course as perverse as my running friends are, they return multiple times. The Georgetown 10-Miler was on the list in my Roughed-Out Race Schedule and was also scheduled for this weekend. I made the switch to Chambersburg, mostly to take on a tough course as a final test that my knee is ready for Boston‘s hills. It was also an opportunity to take along some registration applications for the Capital 10-Miler scheduled at the end of March. And hilly it is at Chambersburg. What everyone describes as a “monster hill” greets runners as they climb several hundred feet beginning before mile 3, only to tackle that same hill on their return around mile 10. It was refreshing to participate in an old-school race; no chip on the shoe or the bib, just an experienced and accurate team with a clock at the start/finish and an efficient crew pulling bib tags as you move through the finish line. What I saw on the 13.1 mile course is beautiful farm country, cattle and barns so close to the road you can almost touch, deer running across the distant hills. It is a race open to road traffic with volunteers posted at several locations. However, it is a course where all of a runner’s senses must be engaged. Traffic isn’t heavy and drivers were patient and considerate, but dips between hills makes it difficult for vehicles and runners to see each other from any distance. Having scheduled a long run earlier in the week, my legs were not ready to give me a strong half-marathon time. I made the decision early in (even before the monster mile) to pace myself to run at goal marathon pace, using the race as a day of my training plan. 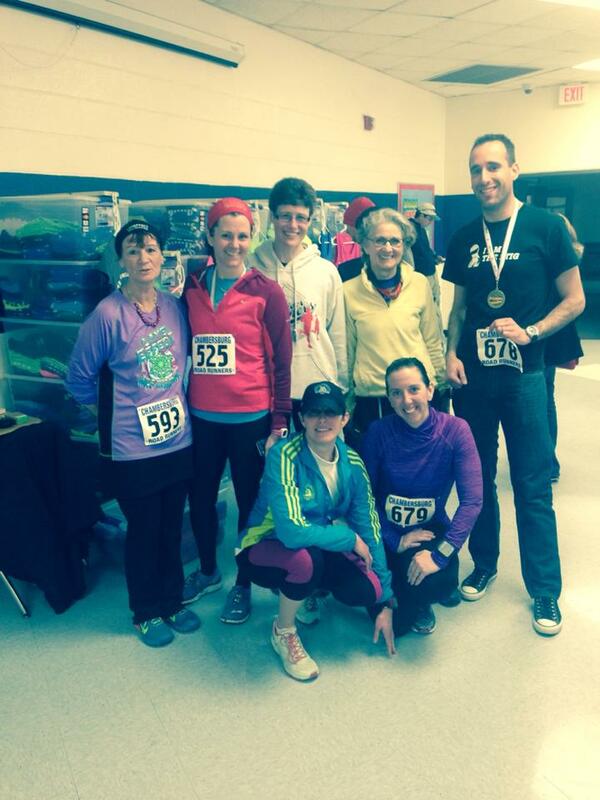 Some of my running tribe – River Runners did well in AG awards and even one 1/2 PR. Outcome? 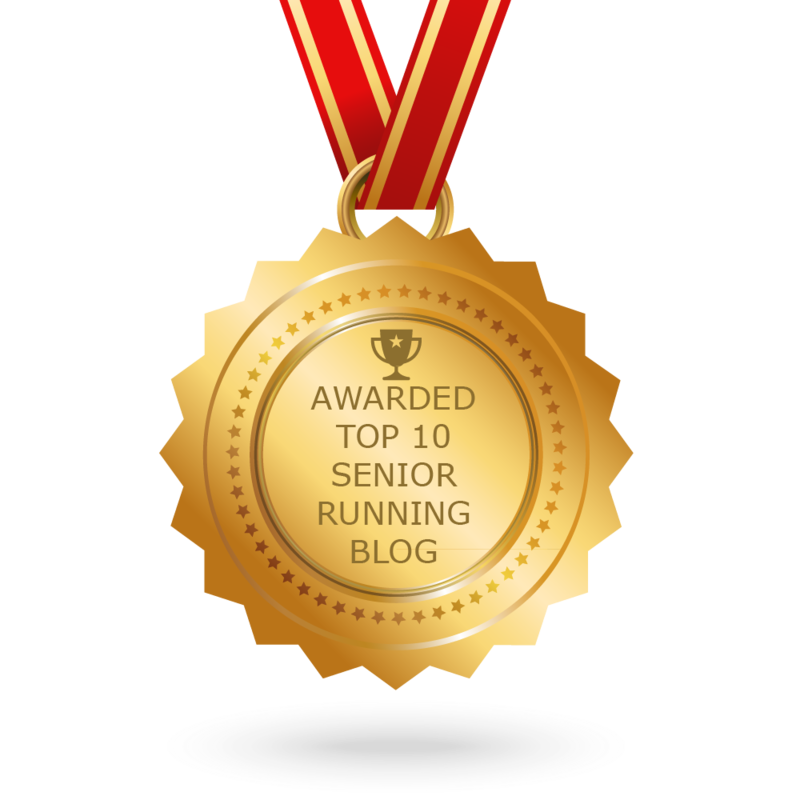 2:06 & change and I did manage to place in the 55+ age group (as a senior runner at age 66, I should make that 55++). Not surprisingly, race officials prohibited strollers, dogs and headphones from the course, both in writing on registration applications and again verbally prior to the start. What was surprising was the officials’ swift action to disqualify runners who defied the prohibition and ran with listening devices. As a race director, I know it isn’t easy to enforce rules that may have runners deciding they won’t be back to your race. It was refreshing to see Chambersburg holding tough on this for the safety of all runners. If you plan ahead and are into a hilly country course, Chambersburg has a race application for 2015 on their website, linked above. Just leave your music at home and bring your love of country roads.